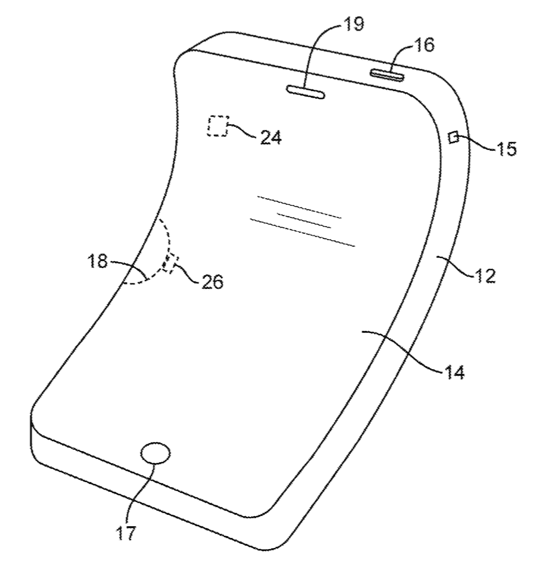 Apple has been granted a patent by the United States Patent and Trademark Office (USPTO) today for flexible electronic devices where all the electronics, not just the screen, are made from flexible materials. 2 What can a flexible device be used for? 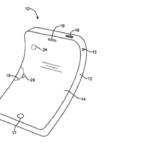 The patent application, entitled “flexible electronic devices” describes a flexible electronic device that comprises a flexible housing, a flexible display, a flexible battery and a printed circuit having at least one flexible portion. 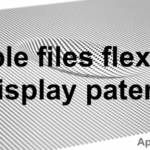 The patent describes the need for flexible electronics that use flexible components such as organic light-emitting diode (OLED) displays that may help to avoid damage in the event of an impact such as a drop of the device on a hard surface, and that “It would therefore be desirable to be able to provide improved electronic devices”. 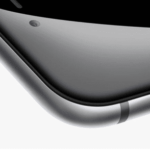 RELATED: drop protection for electronic devices. Furthermore, flexible electronic devices may be more resistant to damage during impact events such as drops because the flexible device may bend or deform while absorbing the impact. Deformation of this type may increase the duration of an impact thereby reducing the impulse received by other components of the flexible device. What can a flexible device be used for? The deformable nature of the flexible display may allow a user to interact with the user interface components by moving the display into contact with the user interface or by allowing the display to locally flex (e.g., to allow sound to pass through the flexible display or to allow barometric pressure measurements of the exterior environment to be made by an internal pressure sensor). 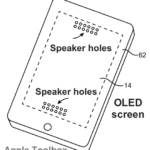 The patent also states that a portion of the flexible display may form a membrane portion of an electrical component. 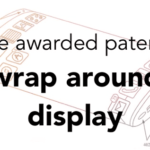 Components that may be provided with a membrane that is formed from a portion of a flexible display include microphones, laser microphones, pressure sensors, speakers, etc. User interface components may be configured to detect deformations of all or part of the electronic device. Deformations detected by user interface components may be interpreted by processing software associated with the device as user inputs to the device. As an example, a flexible device may be foldable so that the device may be folded for storage (e.g., in a pocket). User interface components may be configured to sense that a device has been folded and to cause the device to enter a standby or off mode. User interface components may be configured to sense inactive deformations of the device (e.g., a folded or open position of the device) or may be configured to detect active deformations of the device (e.g., active twisting, squeezing, bending or otherwise active deforming) of the device. As another example, user interface components may be configured to detect a twist of a flexible electronic device. User interface components may be configured to initiate a response from the device to the detected twist such as turning the device on or off, entering active or standby mode, answering a cellular telephone call, starting a software application, changing a volume associated with audio or video playback of media, starting or stopping audio playback of media, etc. 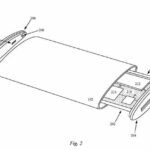 The patent was first filed for in September 2011, but there have also been several examples of flexible phones released since then, notably the LG G Flex, and the new LG G Flex 2 which was revealed at the Consumer Electronics Show (CES) in Las Vegas this week. It’s not clear how the Apple patent will affect existing consumer products, or exactly what patents LG owns in relation to flexible displays. Apple credits Jeremy C. Franklin (San Francisco, CA), Scott A. Myers (San Francisco, CA), Benjamin M. Rappoport (Los Gatos, CA), Stephen Brian Lynch (Portola Valley, CA), John P. Ternus (Los Altos Hills, CA), Justin Wodrich (Saratoga, CA) as the inventors of U.S. patent application number 8,929,085. 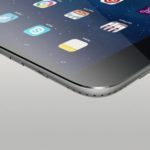 Apple was also awarded other patents recently, notably iPhone drop protection mechanism, communicating stylus, and a method for concealing sensors.